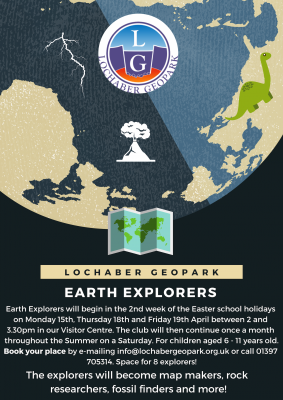 Lochaber Geopark’s new kid’s club is here! Earth Explorers will begin in the 2nd week of the Easter school holidays on Monday 15th, Thursday 18th and Friday 19th April between 2 and 3.30pm in our Visitor Centre. The club will then continue once a month throughout the Summer on a Saturday. For children aged 6 – 11 years old. Book your place by e-mailing info@lochabergeopark.org.uk or call 01397 705314. Space for 8 explorers. Each session will be delivered by our STEM ambassador staff geologist. The explorers will become map makers, rock researchers, fossil finders and more! The club is free of charge. Any donation towards material would be appreciated.